execp_lclick_command = notify-send "$(uname -srn)"
The screenshots show a 12 hour clock but the config I posted here is 24 hour. I use one on my Surface Pro IV but it is more modded for touch screens. This sounds good to me. CTS layout is a bit strange or maybe I'm just used to the clock being near the systray - and something like a menu-icon on the top. 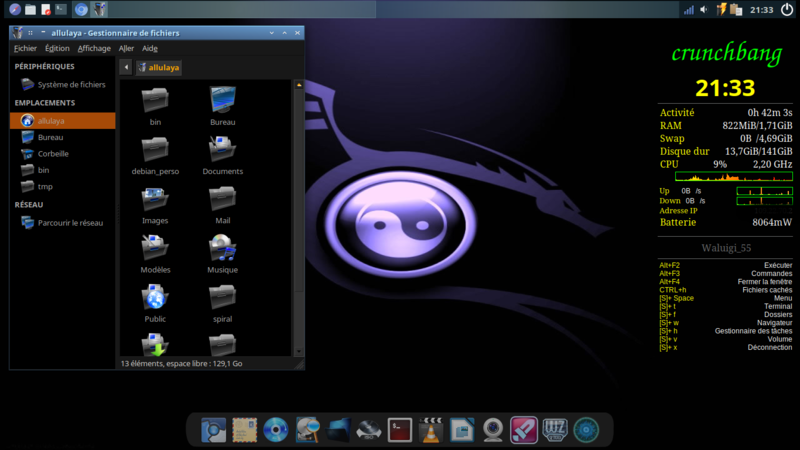 Does that configuration show five icons on the systray area (i.e. does it "grow" automatically) as well? Otherwise I like having vertical panels. @tknomanzr "more modded" - bigger icons? I have a left-sided tint2 config for use on widescreen laptops, I'd like thoughts on adding it to our helium tint2 configs. CTS layout is a bit strange. Easily changed in the tint2 configuration. ... and something like a menu-icon on the top. Redundant, press your Windows key on your keyboard any time in your session to display the Openbox Main (root) Menu. Looks good! I was thinking it would be nice to have some more examples of what tint2 was capable of. As HoaS suggested elsewhere, how about putting it into a new BLOB theme, along with some alternative settings in other files? The menu icon at the top wasn't meant to be for the Openbox Menu - that might be sort of superfluous as it's easily available anyway - but for something like the dynamic jgmenu. Is it possible to make a tint2 panel that works a lot like wbar? Yes, and BLOB as a whole needs some love. I'll see what I can come up with over the next week. Ahh ok...wbar runs fine on this machine but was just wondering if tint2 can be used in place of it. trés bonne distribution, merci pour vos efforts. tint2 doesn't do animations, but the user can set the color and opacity for task and launcher icons. So there is some bling. I like the idea of adding a vertical bar option. Variety is good.